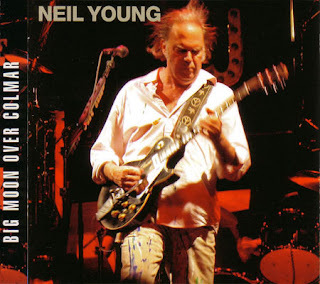 This is Neil Young live in concert at Le Theatre de Plein Air, Colmar, France, back on Friday. August 15th, 2008. This recording was circulated on a two silver disc CD bootleg entitled 'Big Moon Over Colmar' and released by bootleggers Crystal Cat Records (915-16). The sound quality is superb and would pass for soundboard however, the audience noise between songs does suggest that the recording includes audience based microphones. Whatever the case this captures a really incredible gig with the inclusion of some remarkable songs from Neil Young's musical career.